Tesla doesn’t report vehicle sales on a monthly basis for the US, as do all major automakers. Tesla has also been very vague about Model 3 production levels. This has led to a strange sub-industry that tries to use unconventional methods to figure out what we could simply ask of another carmaker. Tesla doesn’t do anything like a traditional carmaker. A particularly annoying deviation from business-as-usual is the company’s production and sales data. The company doesn’t report US sales on a monthly basis, like every other major automaker selling vehicles in the US. Tesla shares that information on a quarterly basis, depriving financial markets and the public of transparency around the company’s operations. On the plus side, when it comes to Tesla’s high-ticket luxury vehicles – the Model S and Model X – annual production appeared to be calibrated for about 100,000 in deliveries. So we can reasonably predict something like 25,000 in quarterly production, which boils down to roughly 8,500 vehicles per month. If Tesla can sustain demand for the Model S and X, we could start to think of those cars like the stalwart sedans and pickups of the US market. Ford, for example, is always going to build around 800,000 F-Series pickups, give or take 100,000 depending on demand. Nobody thinks about this – it just is. Bryan Logan/Business InsiderSomeday, this can be yours. Someday. 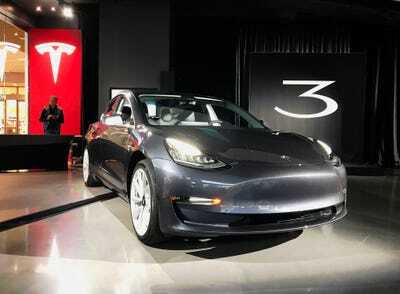 The mass-market car, priced at launch at $US35,000, but currently only selling in a $US44,000 version, was supposed to be pushing Tesla toward something in the ballpark of 400,000 units in 2018-2019. But thus far, Tesla has manufactured only about 2,700 since last July. The company says it will get to 5,000 per week by the end of the second quarter of 2018. Obviously, there’s a lot of ground to cross between those numbers, and anybody who placed a $US1,000 deposit on a Model 3 has to be asking what the holdup is all about. Additionally, a whole strange sub-industry has emerged around figuring out how many Model 3s Tesla is making. Bloomberg appears to have recently exerted considerable effort on this dark art, scouring the internet for reported Vehicle Identification Numbers and even asking Model 3 owners to send in the VINs. By Bloomberg’s analysis, 7,341 Model 3s have made it off the assembly line as of Valentine’s Day. At some point, the floodgates will presumably open and CEO Elon Musk’s much-discussed exponential production ramp will truly take off. It’s too early in the Model 3’s roll-out to not give him the benefit of the doubt, although it’s worth noting that it took the company about a decade to hit 100,000 in yearly deliveries on the Models S and X. For years, Tesla has played this game with Wall Street, the media, and fans. We’re effectively not allowed to know what’s happening with sales or production. Mind you, the traditional industry isn’t 100% transparent because an automaker’s US sale is to a dealer, not an end customer, and car companies can also sell a ton of vehicles all at once to rental agencies and governments (so-called “fleet sales”). But for the most part, monthly and yearly auto sales aren’t a giant surprise, and they’re reported in the US both regularly and in detail, right down to specific models. BMW might sell a few less 3-Series sedans than in the past, in a given month or during a given period. But we can more or less predict what the overall totals will be, and on top of all that, the carmakers will generally alert the media when production is being increased or reduced. The Model 3 roll-out has been the worst I’ve seen in over a decade of covering the auto industry, so I can understand why the company wouldn’t want to engage in any kind of regular updating on production, beyond earnings calls and the quarterly releases. The botch has now led to this free-form approach to shedding some light on Tesla’s black box. But that approach shouldn’t be necessary. If I want to know how many Camrys are coming in 2018, I can just call up Toyota and ask. Automakers are even quite transparent about vehicles that aren’t expected to do great business. Last year, Cadillac was happy to tell me that it doesn’t expect to move very many of its CT6 plug-in hybrid sedan, a niche product. Kudos for Bloomberg for doing some legwork on the great Tesla Model 3 mystery. But if you examine the result of their “Tesla Tracker,” you won’t be shocked. Tesla is falling absurdly short of meeting demand for the Model 3, based on the 400,000-ish pre-orders that have been booked. And the company has a mountain to climb to make good on its promises for 2018.